Growing up spaghetti bolognaise was my staple meal. When we went out for dinner, mum would make sure they had the good ol’ spag on the menu (either spag or lasagna) and I would be one happy chappy. After having ongoing problems digesting wheat and grains over the last few years I went off pasta with the exception of whole meal or spelt versions. After investing in a vegetable spiraliser / julienne peeler I have been able to reunite with my spaghetti bolognaise and pasta love and let me tell you – it’s life changing! Super simple and effective, zucchini pasta is becoming a bit of a fad around raw kitchens and wholefood healthy conscious cafes – with good reason. It means that us unfortunate type with a stomach that hates me more than life itself, can still enjoy twirling that pasta around my fork and splashing red Napolitano sauce all over me. 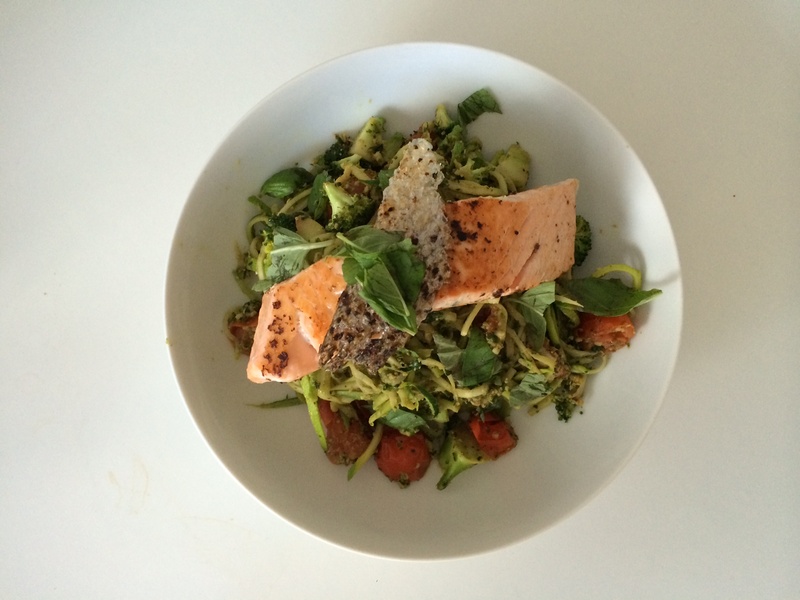 A favourite in our kitchen at the moment is my pesto pasta topped with a fillet of crispy skin salmon. 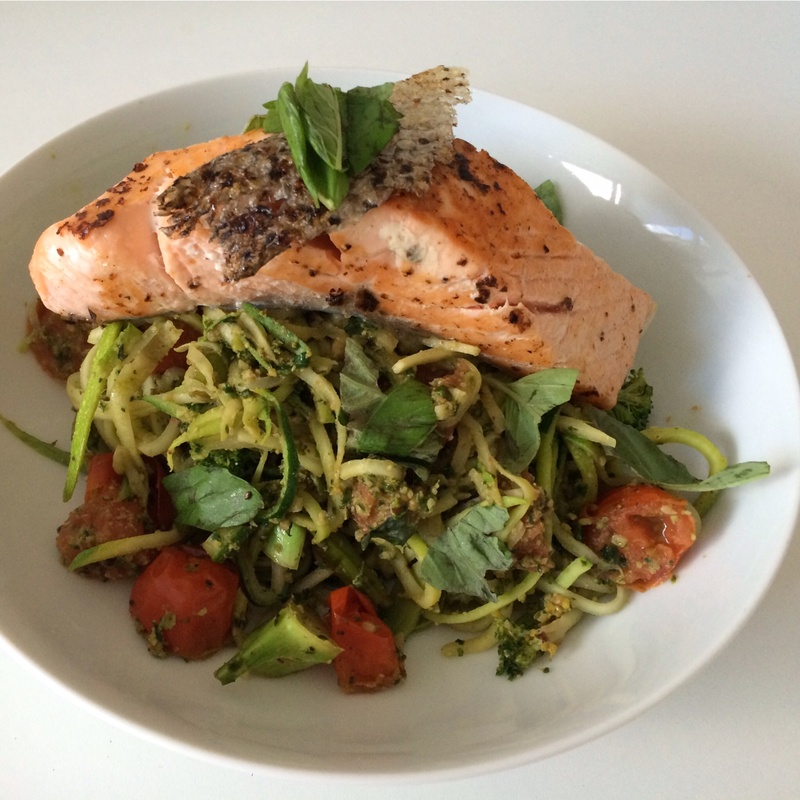 Perfect combination of protein, essential fats, omega 3’s and greens. 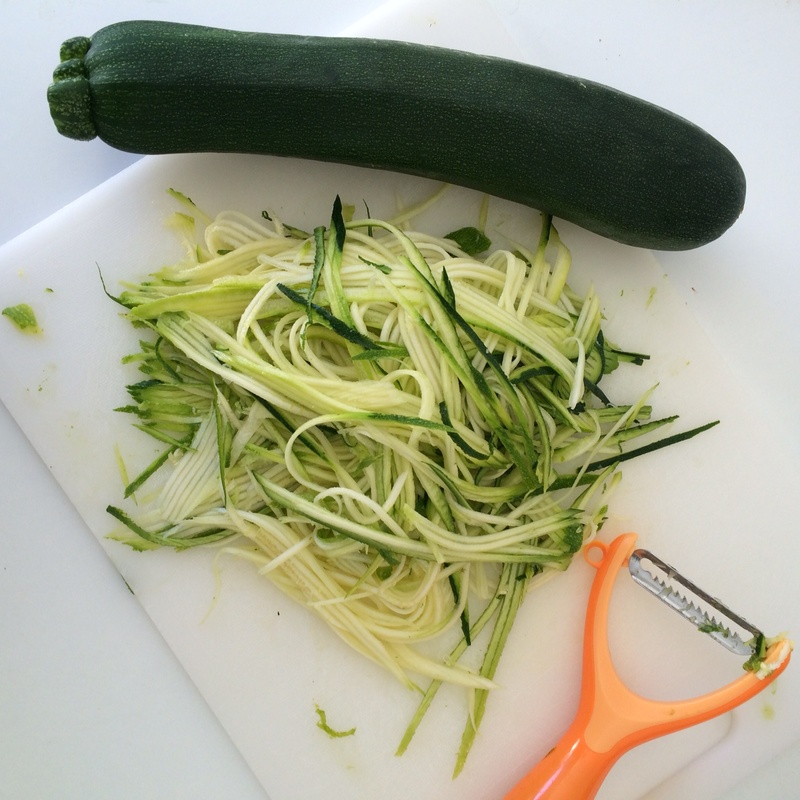 METHOD: Using the spiraliser/julienne peeler, peel the 3 zucchinis until you hit the core. Don’t peel the core/seeds. Set aside for later. Finely chop the zucchini cores up and place in fry pan with some olive oil. Add chopped asparagus and the cherry tomatoes and sauté for 5 minutes. Add the pesto sauce and stir until combined. In a second fry pan – fry the salmon pieces in some olive oil until nice and crispy. I like mine to be slightly undercooked so just cook it until you are satisfied. Set aside. Pour some olive oil in a hot pan and add the zucchini pasta for 2-3 minutes. 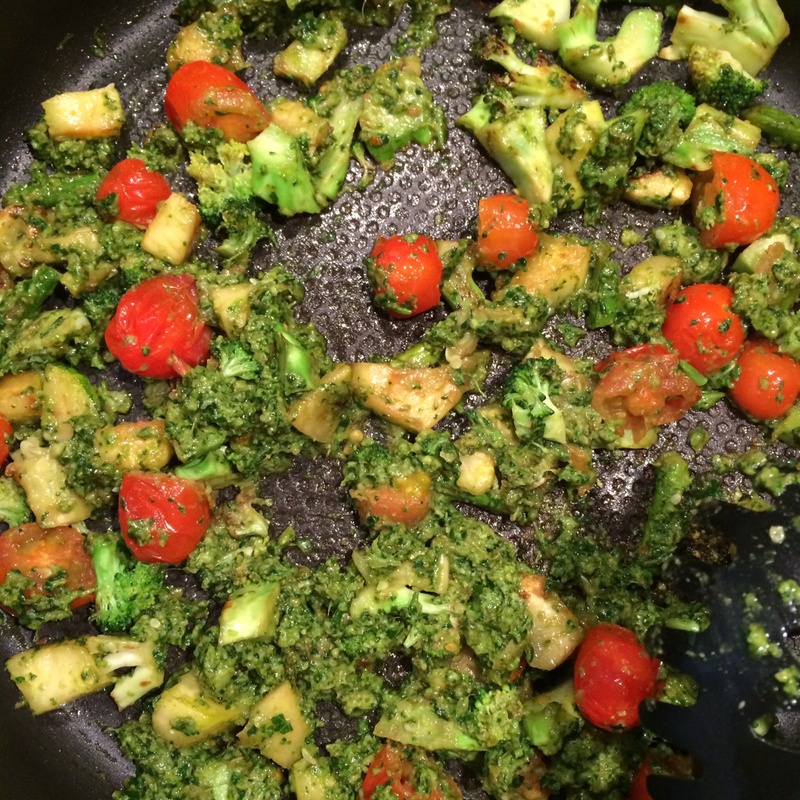 Add the diced zucchini, asparagus, tomatoes and pesto mix. Stir until well combined. Don’t over cook the zucchini noodles otherwise they will be soggy. Divide the pasta into two bowls and top with the fillet of salmon and some extra parmesan cheese and walnuts. Garnish with a fresh basil leaf and serve! They wont believe its zucchini!! This recipe is by the incredible Adriana Harlan, author of “Living Healthy With Chocolate”. 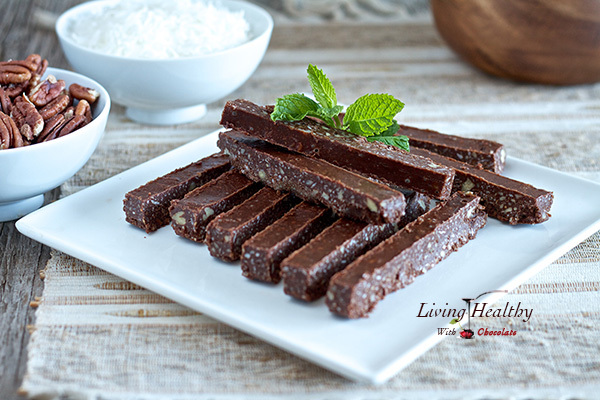 If anyone knows a thing or two about healthy clean chocolate treats it’s Adriana – and so I wanted to share this amazing recipe with you as choc mint is one of my serious weaknesses!! You will love it! P.s Mum – when you get back from your travels you MUST make this for Dad!! freeze until chocolate is set then cut into sticks. Store in airtight container in freezer.